Yesterday we had two very special visitors to our school, Mairtín Ó Conámha and Johnny Maughan, They came to talk to us about our local water scheme as part of our Green Schools project. We were really interested to discover that Johnny was not only involved in setting up the local water scheme in Glencorrib, but he also played a big part in building our school! 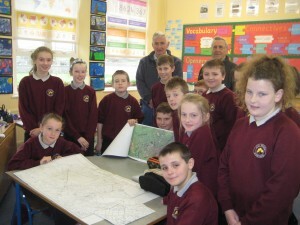 They showed us maps of the water scheme and we were all able to locate our houses on them. We learned that the source of all our water in the school is Ballynalty Bay. Johnny and Martin helped us remember the importance of water as they described it as the most important component on the earth – where there is no water there is no life. We told them all about our Greens Schools project and what we have been doing to reduce our water consumption in the school. Last week we carried out a second water audit in our school. They were very impressed when we told them that we have reduced our water usage by 4.15 litres per pupil per day since last year. At the moment, we are roughly using 8 litres of water per pupil per day. We really enjoyed their visit and are hoping that Johnny will come back some other day and tell us all about school in the older days. Glencorrib NS and Footsteps Preschool Glencorrib will hold an Enrolment Evening in the school on Tuesday February 7th, from 6-7pm. Parents interested in learning more about the school and preschool are welcome to attend to meet the staff and have a look around the school. Enrolment forms and information packs will be available on the evening and tea and refreshments will be served. For further information please contact the school on 093 31415 or Edel in the preschool on 087 690 6462. 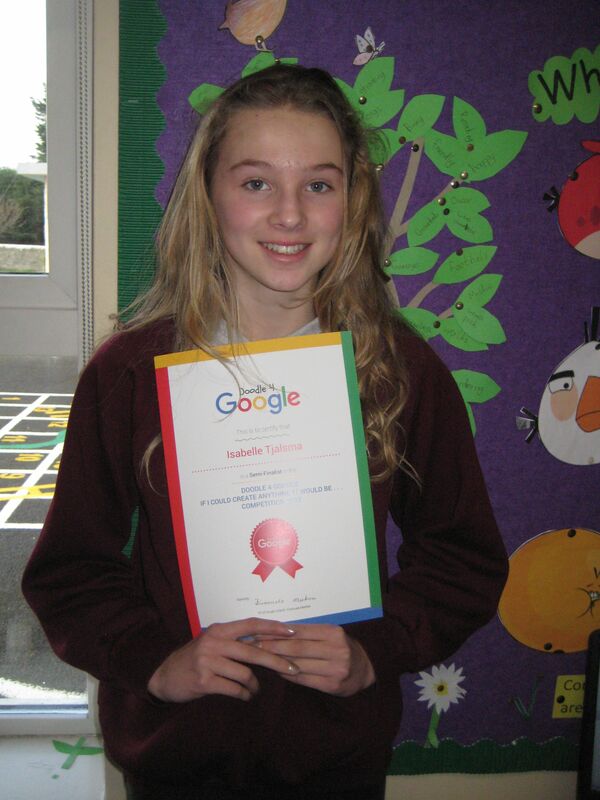 Well done to all our pupils on their brilliant entries for the ‘Doodle 4 Google’ competition. A special congratulations to one of our 6th class pupils, Isabelle Tjalsma, on being selected for the semi finals of the competition. 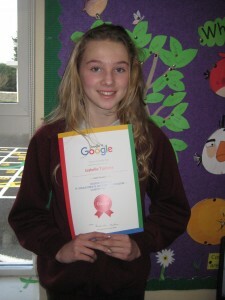 Isabelle has been selected as one of 15 finalists from the 4th – 6th class category in Connaught. This is a fantastic achievement and we are very proud of her. This years ‘Doodle 4 Google’ theme was entitled “If I could create anything it would be..”. Isabelle is a very talented artist and designed an entry based around creating a time machine. We wish Isabelle the very best of luck for the next stage of the competition.